Check out our message board and site, that connects you with thousands of bulk wholesalers from around the world. All you have to do is register and you can post ads for free on this site. NEWEST DEAL: We have over 3900 AS/IS monitors. Our wharehouses are full to the rim. They are from 21" to 14" (15pin, few 9 pin, 350 macintosh (newer models) BNC-VGA - Wyse terminals and much more) Email if your interested. Bulk orders available only. We have stock that is fully tested, or untested, you can buy them for CRT's or just ship them right to your customer in bulk. No screen burn, good condition and very dependable. Perfectly working windows 95 compliant monochrome VGA! 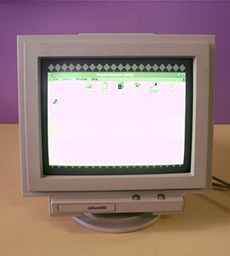 We have under 400 units left of monochrome vga monitors. Hurry while they last. We now have Samsung as well as Olivetti. Getting new stocks all the time. Buy them in bulk now! Get them now, while we still have them. This sale will not last forever. They're selling like hotcakes! Use them for small or large businesses, for word processing, we have tested the monitors. When making inquiries about the monitors please leave your shipping address (address plus zip/postal code) so we can calculate shipping costs for you. We also have many bulk monitor deals. If you need 5000 super vga monitors, 15", 17", 19" or larger! Whatever your needs are, we can find a deal for you. We have more pictures to view, just click on the monitor above or click here to see more pictures. You pay the shipping charges and boxing. There is no GST from this sale. It came from an office building with networks that was converted in to a flea market. Used cable about 1 year old so in very good condition. Was inside the walls of the building walls. We also have NEW 1000 feet of coax cable. If you are in need of a large ongoing supply of bulk monitors, we can help you. Mention the amount, the condition, where they are to be shipped and any other requirements. Feel free to contact us for more info. More pics are here.